After recipes for herring, tripe and codswallop (fish stew, a popular dish in the Middle Ages) comes that beginning “Taketh one unicorne”. The recipe calls for the beast to be marinaded in cloves and garlic, and then roasted on a griddle. 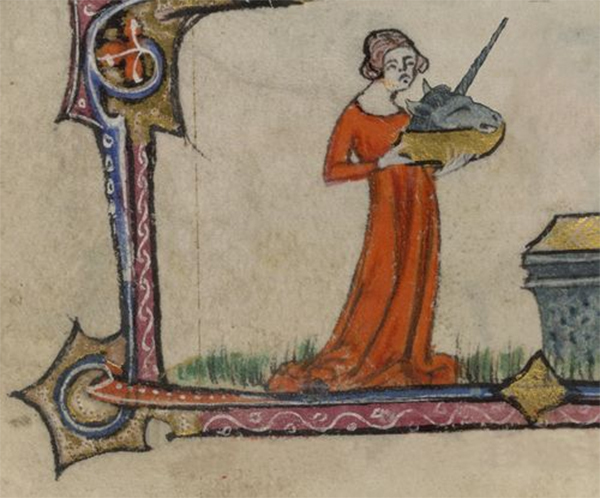 The cookbook’s compiler, doubtless Geoffrey Fule himself, added pictures in its margins, depicting the unicorn being prepared and then served.